I'm still going through magazines and catalogs that accumulated here at home while we were on the road for so many months! Today, I was looking at an issue of the official AAA magazine, and ran across an article about Florida's beaches. 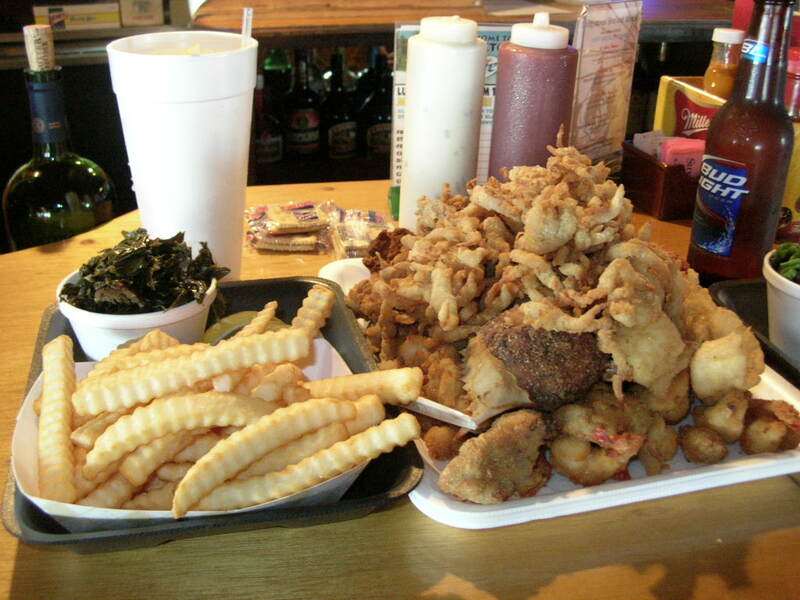 I began to reminisce about some of my favorite coastal haunts and thought of Mayport, and Singleton's Seafood Shack -- whoa! Did I really forget to include Singleton's on my list of favorite places to eat? Let me correct that oversight right now. 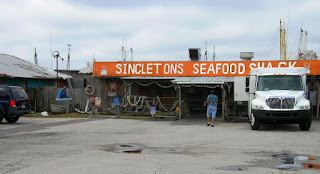 Singleton's is not just a favorite; it is the favorite seafood place. We first heard of it several years ago, when playing at an art fair in Ponte Vedra Beach, near Jacksonville. My high school friend Jay, an officer in the U.S. Navy, had discovered Singleton's while stationed at the huge base in Mayport, also near Jacksonville. 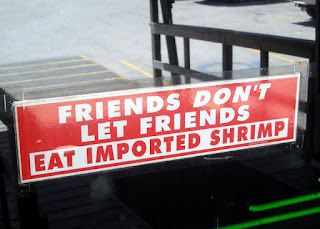 Jay suggested that we'd love the seafood, and revel in the down-to-earth atmosphere: "It's easy to find," he said with a grin, "just follow A1A north to Mayport, then look for the dumpster with all the cats." After the art show closed for the day, Greg and I headed north ... away from ritzy Ponte Vedra and its golf courses ... past Jacksonville Beach, Neptune Beach, and Atlantic Beach, with their surf shops and souvenir stands ... pointed toward the Naval station, passing pawn shops and strip clubs along the way ... finally ending in the sleepy little village of Mayport, an area that, like nearby St. Augustine, had settlers well before the Pilgrims landed at Plymouth Rock. Mayport's sort of the end of the road; the only way to travel north out of town is via the ferry which crosses the St. John's River. That's probably helped to keep it a quiet place -- that and the fact that it seems mostly to be populated by folks whose families have been involved in the fishing industry for generations -- though one of the big casino cruise ships docks there, and its directors would like to see more nearby attractions. Singleton's itself was attraction enough for me. With its creaking, listing floor and oddly mismatched furnishings (including hard benches! ), it probably doesn't appeal to the "fern bar" crowd, but it certainly has developed a loyal clientele. That evening, our fellow diners included uniformed Navy personnel, a few families, several couples and groups of friends, the obligatory grizzled old fisherman just off the boat for the day. The hardier among them were out on the deck, enjoying the "million dollar view" of the St. John's River. Since we'd been out-of-doors all day long on that somewhat blustery day, we elected to sit at the bar. Just studying the menu was a delight! All of the predictable offerings were there: the shrimp, oysters, and grouper. But overhead there was a chalkboard with selections that vary from day to day, depending on what's come in on that day's catch. On that particular evening, I chose sheephead, a local fish. In subsequent visits, I've decided not to decide, and have chosen a combo. 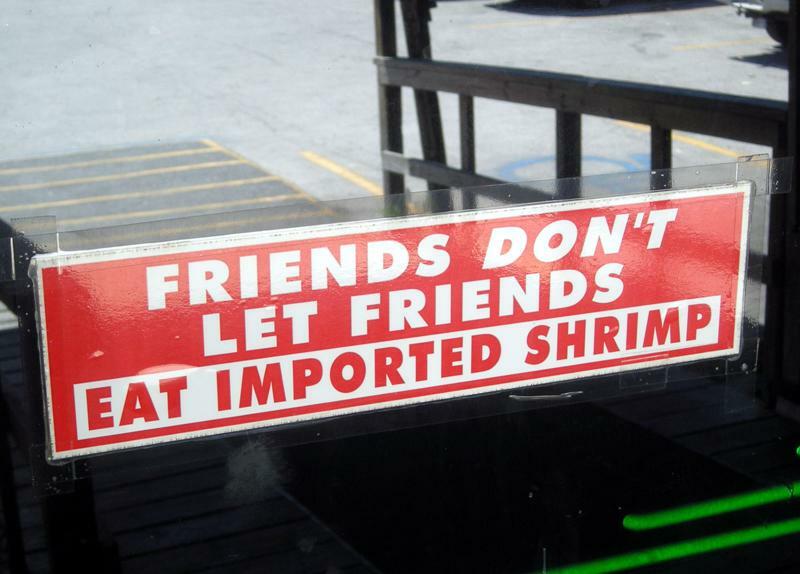 Shrimp's probably the most popular item, and why shouldn't it be, since the local waters boast some of the finest, sweetest shrimp to be found anywhere in the world? Another popular item is the Minorcan Clam Chowder -- Minorcan, you say? Yeah, adding to the endless squabbles over whether Manhattan or New England clam chowder is best, there's a third, much less known contender: cousin to Manhattan chowder because of its tomato base, Minorcan Clam Chowder has the potent, and not widely-available, datil pepper for its signature ingredient. What a kick! If you ever find yourself in the Jacksonville area, I highly recommend a visit to Singleton's. Jacksonville is not an easy city to navigate, so don't think that you'll be able to pop over to Mayport for a quick lunch as you're traveling down I-95. But if you're staying in the area, or if you're aimlessly and leisurely traveling and can afford a detour of a few hours, you can treat yourself to not only a great regional meal, but to a little slice of "old Florida." With Thanksgiving only a few hours away, we have plenty for which to be thankful this season! Phone calls continue to come in: ticket orders for Christmas With The Celts concerts that are almost a month away. The Toe River Arts Council, a North-Carolina-based organization of which we are members, just placed a big CD order: they sell our CDs in their two galleries, and several of the titles were completely sold out, or stock was perilously low. Sales of digital downloads, through companies like iTunes and Rhapsody, are up almost 40%. And Divine Providence seems to have had a hand in a dicey situation we very recently faced. Due to booking difficulties, one of the bands that was scheduled to perform at the Caloosahatchee Celtic Festival had to cancel their appearance. With barely two months until the festival, finding a replacement "headliner" seemed a daunting task -- yet both Greg and I were strangely calm; we decided that we would enjoy our weekend at the Sarasota Medieval Fair, and begin worrying about Caloosahatchee on Monday. 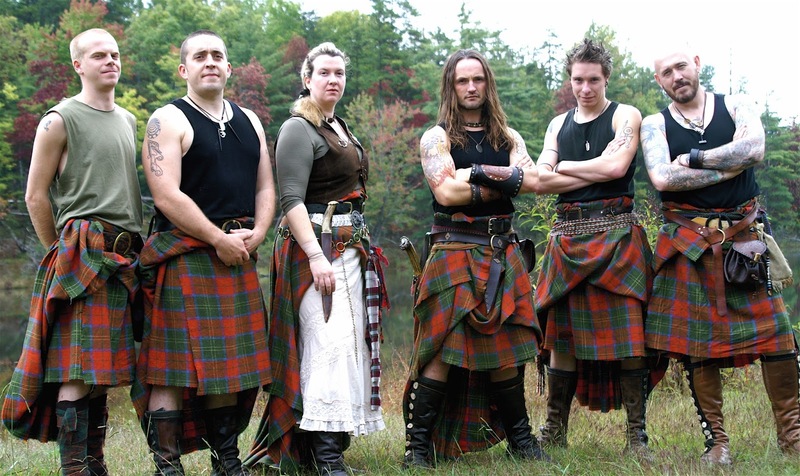 Lo and behold, on Monday morning -- before we'd even had a chance to begin worrying -- we received a phone call from a promoter representing the Scottish band Albannach. You see where this is going, don't you? ... the band had an open weekend in their schedule -- would we be able to book them? 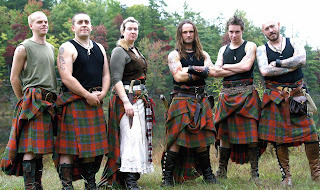 ... and a few phone calls and e-mails later, I'm pleased to announce that Albannach will be bringing their unique and exciting form of Celtic music to Southwest Florida! Check them out on YouTube -- you won't be able to sit still! God bless each and every one of you this Thanksgiving, and always.